Quinns: As “escape rooms” continue to spread across the world like an architectural venereal disease (but a nice one! 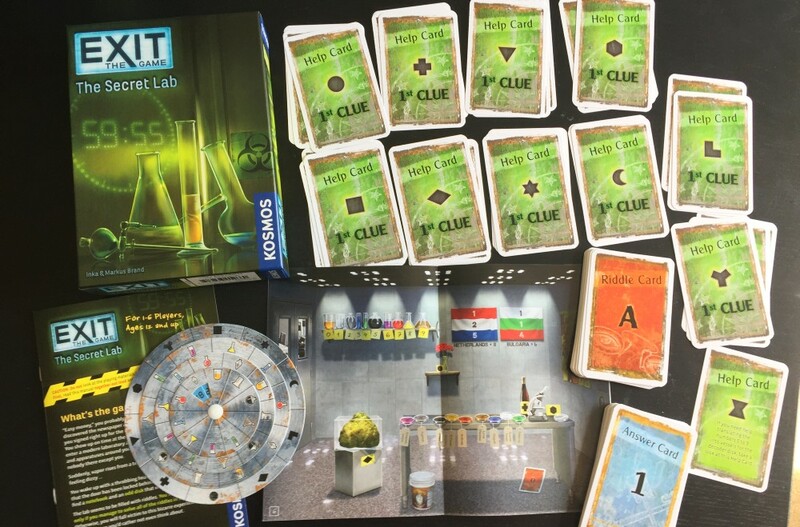 ), you may or may not know that there are now lots of escape room board games. Yes! You can have (almost) all the fun of escaping a real room, but at a tidy fraction of the price. For the last few weeks I’ve been fretting and sweating against these games’ arbitrary countdowns, searching for the best simulation of being locked in a room. And do you know what? I had a consistently happy time of it. But the time for happiness is over. Two series emerged as front-runners during my trials, and it’s only right that I pit them against one another in cardboard combat. From Germany, in the blue corner, we have the prestigious series of EXIT: The Game. And from France, in the red corner, we have the flashy contender known as Unlock! LADIES AND GENTLEMEN! 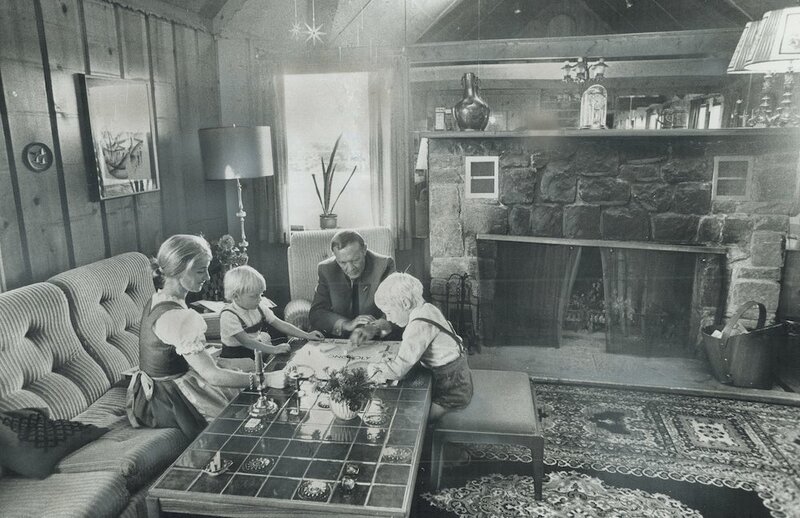 LET’S GET READY TO RUMBLE PUZZLE! Let’s start with EXIT. In the above picture you can see one of the three “rooms” of EXIT that arrived this month in English-language markets. 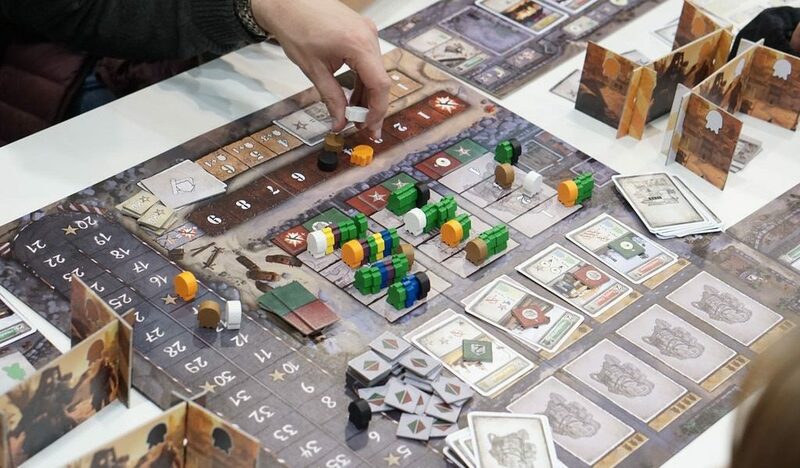 Three more EXIT games are already available in Germany, and Kosmos announced just this week that another four EXIT games are in development, so by the end of 2017 there will be an incredible 10 separate EXIT rooms for you to buy. But this aggressive release schedule makes sense, because the EXIT games are an absolute delight, and the best puzzling I’ve enjoyed since The Witness. Each and every box is the work of husband and wife team Inka and Markus Brand, and I can only guess that life in the Brand household features puzzles the way that ancient Sparta featured warfare. Woe betide the Brand children, who probably have to crack cyphers in order to earn their Christmas presents. Obviously this article is totally spoiler free, but I’ll say this much: EXIT’s puzzles strike a perfect balance between logic and lateral thinking, and tease as much as they test. A full half of EXIT’s puzzles are the sort of thing where when you solve them, a smile stretches across your face like a sunrise, first because you’re pleased with how clever you are, and then because you’re impressed at how clever the designers are. Honestly, playing EXIT is the mental equivalent of running your hands across silk. The whole experience is free from snags and frustrations, and almost lascivious in its smoothness. 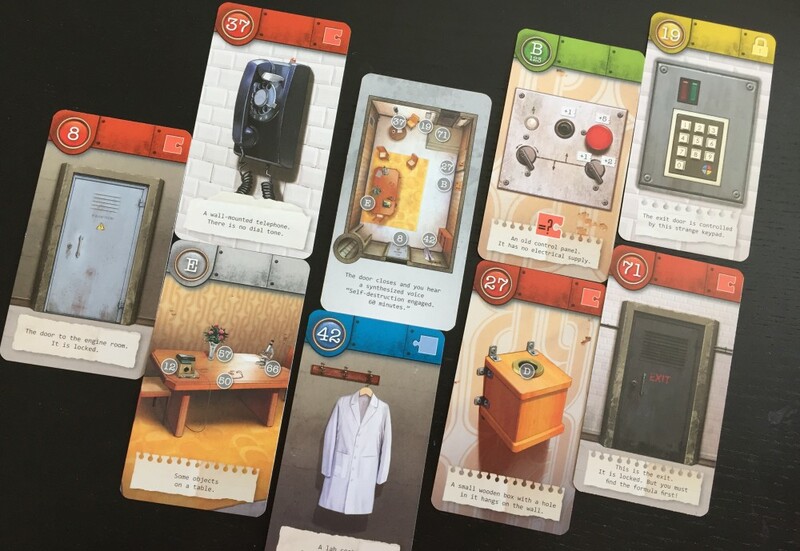 Some of that’s down to the fact that almost half of the contents of any EXIT box are cards that first offer a cryptic clue to any puzzle you’re struggling with, then a helpful clue, and finally the solution, so there’s always the option to be hoisted out of any mental rut you slip into. Surely that’s our content finished then? If EXIT has the best puzzles, that must be a knockout blow delivered to Unlock!? Well, no. There’s just one problem with EXIT games, something that actually gives Inka and Markus the freedom to make such clever obstacles, which is that anytime anybody plays through an EXIT box… they destroy it. EXIT is a literal paper champion. 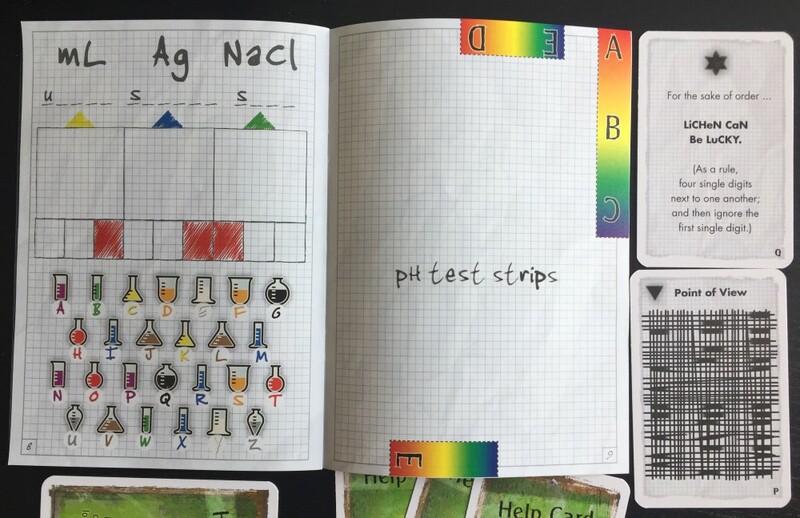 Players progress through the game with pens and scissors at the ready and routinely get fold, cut up or scribble notes on components. There’s absolutely no getting around this. You buy EXIT for £13, finish it in a delightful hour, and then ceremoniously lower it into the bin. So if you thought T.I.M.E. Stories was a troubling value proposition, I’d warn you to steer clear of this series. You might poop yourself with rage. So let’s look at our alternative! Unlock! is actually from the people who brought us T.I.M.E. 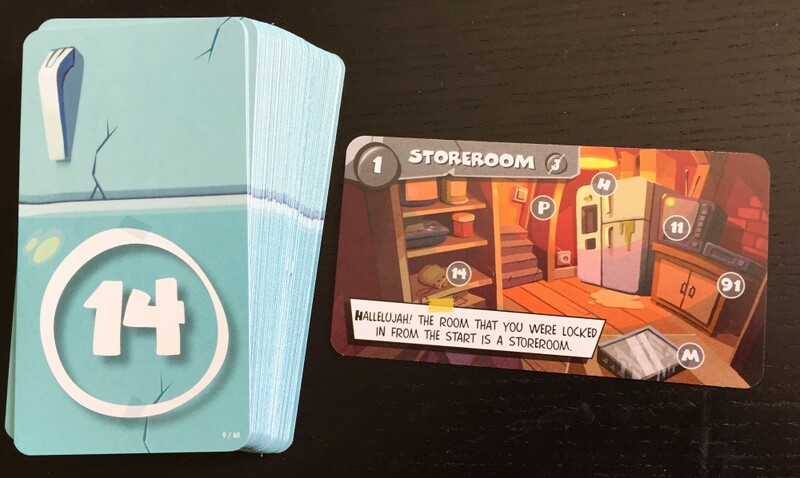 Stories, and (just as with that game) each of Unlock!’s “rooms” is nothing more than a deck of oversized cards. Meanwhile, the official Unlock! app located on somebody’s Android or iOS device times the group, accepts code inputs and dishes out hints. Theoretically this companion app could let the designers do some completely excellent hybrid puzzles, the app acting as a feather in Unlock!’s cap in much the same way that EXIT destroys itself to create cool new puzzles. But actually the designers of Unlock! don’t explore these possibilities at all, and more often than not the app acts as an outsized stopwatch. Even the app’s hint system often fails to kickstart your perception of a puzzle, docking your score without actually helping. It’s not all bad. I do like having a giant countdown next to me while I play, which adds a dash of the drama to proceedings. Another thing to mention to prospective buyers of Unlock! is that if you live in Europe then the game’s available as the above lovely box containing three escape rooms and a tutorial room, offering solid value for money. If you’re in the United States or Canada, Asmodee has made the decision to sell each room separately. Why? I have no idea. 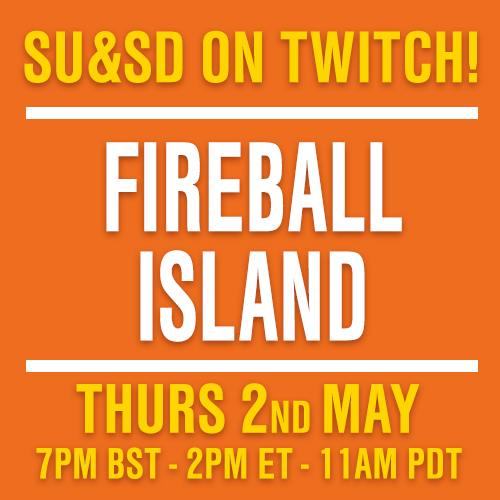 On the other hand, Asmodee has made the tutorial room and an online-exclusive print-and-play room both available as downloads from the game’s site, so you can at least try Unlock! before you buy. And I’d encourage people to try Unlock! if they have a printer at home, because it’s good! It really is very good, and having a nice piece of art on every card gives each deck a wonderful sense of place. I don’t want to say the puzzles are amazing or anything because EXIT has broken my ability to judge good puzzles, a bit like how if you expose a geiger counter to too much radiation then it can’t read low levels anymore. But my wife and I had an awesome time working our way through all three of the current Unlock! rooms, and vitally, now we get to give our near-mint condition copy to one of our friends, which feels a hell of a lot better than guiltily slipping the box into the recycling. 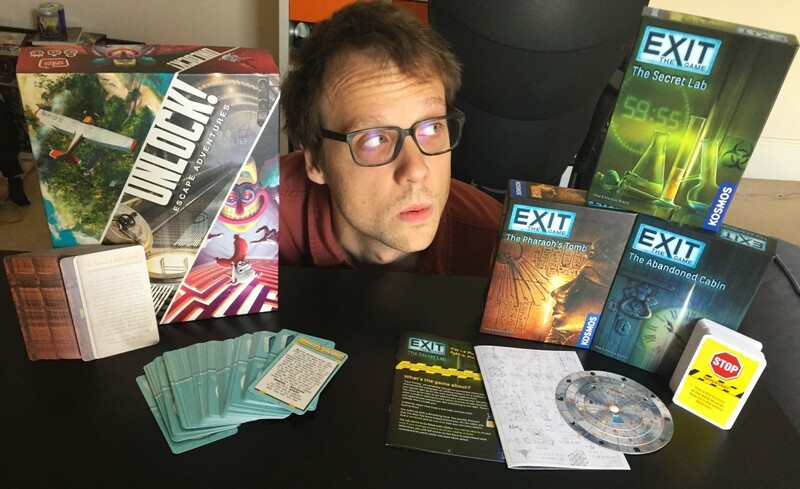 So in conclusion, if you’re at all interested in this new raft of co-operative puzzle solving board games, I’d absolutely encourage you to buy Unlock!, unless you don’t care about your games being disposable or you want a real show-stopper of an experience to put in front of your friends or family, in which case I’d buy any one of EXIT’s adventures. But Unlock! is the series that I’ve personally committed to, and I intend to buy every new room that Space Cowboys release. 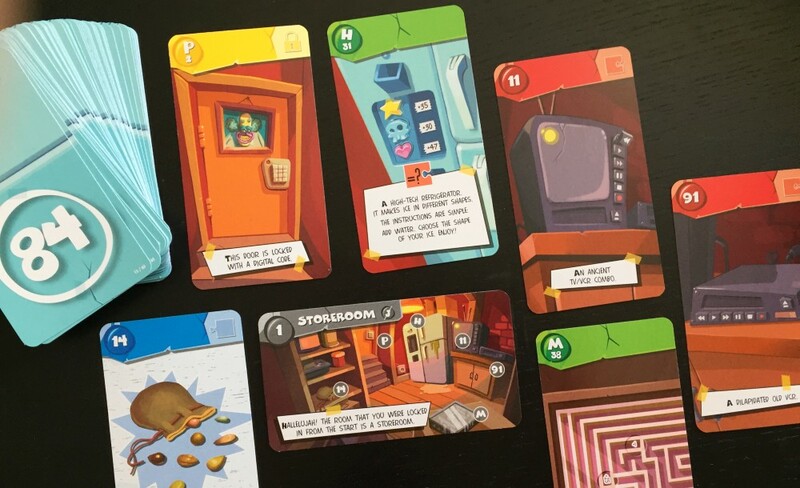 Yes, it’s a sometimes-lumpy, imperfect escape room experience, but it more than makes up for it by you being able to lend it to board gamers and non-board gamers alike. 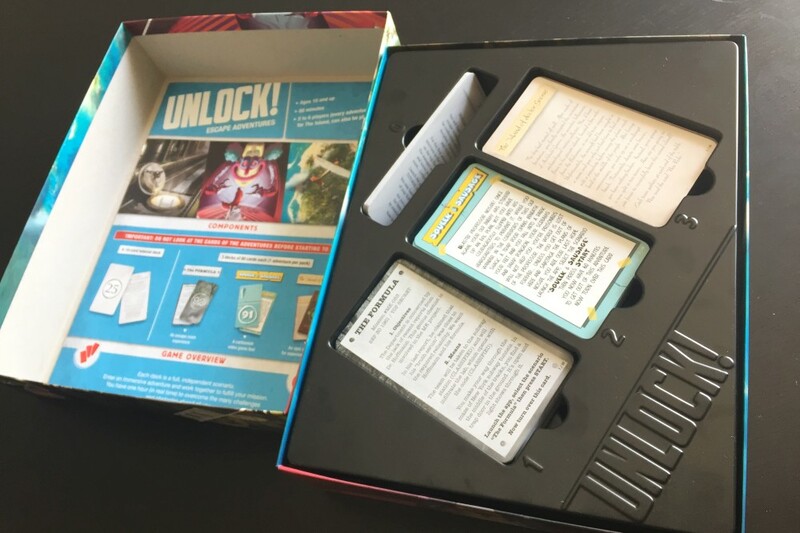 Your copy of Unlock! is going to travel around your social circle like a flu. Heck, I’d even love to take my Unlock! decks around to my friends’ houses and just watch them struggle through a room that I already completed, like happy mice in a my maze. Finally, a note on player numbers. The publishers of Unlock! and EXIT will tell you that these games are good for between 1 and 6 players, which is like saying that between 1 and 6 people can share a normal-sized bath. It’s technically true, but none of you are immersed and you’re all wondering what to do with yourselves. In reality both Unlock! and EXIT are best with two players, I’ve had plenty of fun on my lonesome, and they can maybe fit three or four people if none of you are particularly noisy or headstrong.